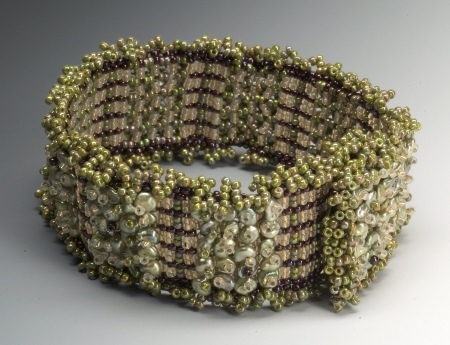 Being in love with keshi pearls, NanC Meinhardt designed a bracelet that combines single peyote, two drop peyote, and right-angle weave to showcase the pearls. An invisible closure adds to the cohesiveness of this piece. This workshop includes bead by bead directions making your bracelet easy to accomplish. You may choose to make the Multi-stitch Bracelet with either size 11 or size 14/15 seed beads. Three colors of size 11° seed beads or three colors of size 14° seed beads. The size of your bracelet depends on your choice. If you are using size 11º seed beads you will need size 14º seed beads as close as possible to color C (see below). One strand of center drilled Keshi pearls. If using size 11° seed beads, the pearls should be 4 x 4 mm or 4 x 5 mm. If using size 14° seed beads, the pearls should be 2 x 3 mm or 3 x 3 mm. You may also use 216 rondelles or semi-precious rondelles size 2 x 3 mm.